Let’s take a look at how Windows 10 manages user accounts. Depending on how many people use your computer, the Accounts screen in Settings is one of the more important features of the operating system. Just see how lacking other mobile operating systems like Android and iOS are in this regard. Microsoft has traditionally presented very comprehensive account management options in all versions of Windows, and Windows 10 is no different. If anything, it goes beyond what previous iterations of the platform had to offer. So anyway, in a typical family there may be a computer that more than one person uses. It could be a PC for your children, or a tablet for your parents — or a device that the whole family uses. If this is the case, then it is best to create a user account for each person. This ensures that settings, files and folders don’t get mixed up. Plus, with user accounts, everyone can personalize and customize the Windows environment however they want, with their apps and settings. This screen is easy to follow, with options to manager local accounts as well as Microsoft accounts, formerly called Windows Live ID. These accounts can either have administrative privileges, and those that don’t are usually considered standard user accounts. There’s also a third type of user account, which is the guest account. Your workplace and Sync settings are the two new additions in Windows 10. Other user accounts screen allows you to manage or add new user accounts. Anytime a new Microsoft account is created, the first time that person logs in, he or she will go through a brief configuration wizard along with the introductory tutorial for Windows. After a new user account is created, Windows also creates a new folder with the new account name in the C:\Users folder. This is where all the personal files of this new user are kept. Only that user, and administrators have access to this folder. 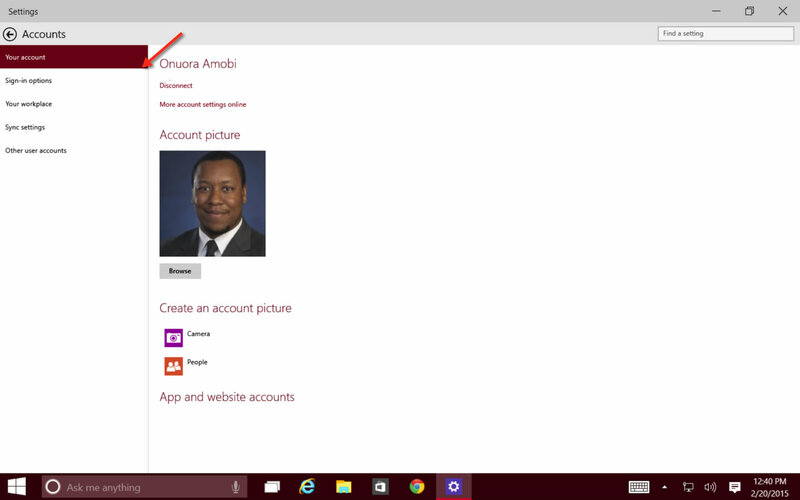 And finally, changing the name of a user account is only possible for local accounts in Windows 10. IMHO, it might be better to have maybe two accounts going forward. 1. A local account (with Admin privileges) with which one carries on one’s business, avoiding the “phone home constantly” metro “apps”. On this account I would uninstall most of the metro “apps”. They chat constantly to the mothership, and I think it is unwise to work and communicate via these devised devices or with them chatting constantly in the background. Employ non-metro software for your business and communication needs. 2. If you must, another separate Microsoft account (without Admin privileges) for playing games if one employs the metro game “apps” from the Windows store. Otherwise just use the #1. account. Consider purchasing some non-metro games and doing away with the Windows Store on a desktop / laptop computer. They will be profiling you, perhaps not as completely as Google is trying to, but nevertheless. Microsoft also uses the Windows store to interfere with the developer community. They want a huge cut (30% of a developer’s income no matter how hard he is struggling) and would want to use the Store to strong arm developers into handing over their income to Microsoft. And as far as Google is concerned, look into how to block Google’s spying. It is a relatively simple matter to block Google analytics via the host file which is already on your computer. Google is literally trying to know everything you do online, so block their tracking attempts. I like using more than one account on my PC. It keeps things real and it is easier to allow younger children to still use the PC, but not make a bunch of changes to it.